7 years ago, I left the city, left an incredible career and moved back to my small hometown. I was a single mom, living with her parents and her new baby boy, in a small town. I was in debt and my fashion degree was no good in this town of 7,800 people…I also had just finished up my career with Lululemon Athletica and didn’t see a close alternative here to work for. I could’ve easily fallen into mediocrity….working a job I wasn’t passionate about, living in a body that I didn’t necessarily love or treat well, and going through the motions that I thought I was “supposed” to be going through. I knew I wanted more. I knew I was destined for more in my life. I launched my own consulting business from the ground up. And I can say that I’m in a great place NOW, but that certainly wasn’t always the case. I had so many slumps and hard times over those years. I was working so hard. I felt so clear on what I was working towards. I was taking the right steps, aligning myself with the right people and making smart choices to push myself and my business forward. And yet…it took a long time to see the progress that I wanted. I felt like my hard work wasn’t amounting to anything. I didn’t feel any closer to my goals and felt like I was just spinning my wheels. It’s discouraging and it’s frustrating to say the least. I could’ve easily given up and gone down a more “traditional” route. I really had to self-coach and lean on the tools I learned and the tools I now teach on in High Performance coaching to get myself through those hard times. 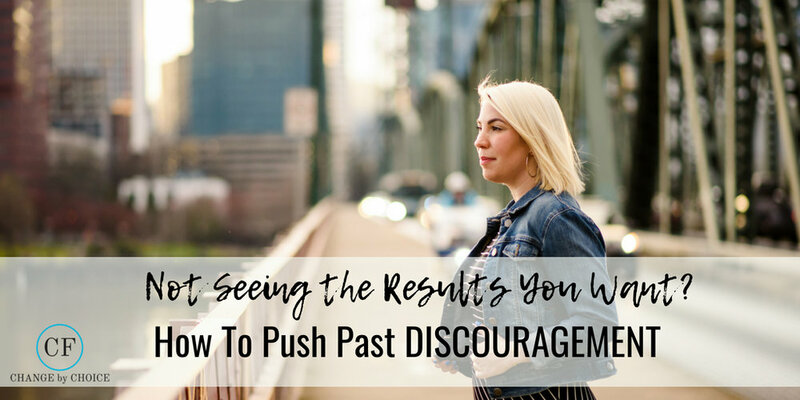 In this episode of the Change by Choice show, I share how to push past discouragement in your life so that you CAN reach those goals. Listen to Episode 56: Choosing Past Discouragement on iTunes, Spotify or Podcast Addict. Let’s start to explore when we feel discouraged and frustrated when we are trying to achieve something, start a business or meet a goal. You see obstacle after obstacle and you just don’t see the light at the end of the tunnel. I’m going to give you some tips on how to move yourself forward so that you can honor that space you’re in, find joy in the process and start achieving those goals. First off, as always, it’s about reflection. Recognizing and acknowledging where and when you get frustrated and discouraged is key; start to understand what your triggers are. When you start to feel those things creeping in – disappointment, frustration, discouragement – take some time to journal. Identify what is causing those feelings to come up for you. Once you’ve identified it, you’re better able to navigate through it. Too often I see people making reactionary decisions because they’ve acted before they’ve even acknowledged WHY they are feeling a certain way and where it is coming from. You can start to be proactive here, too; be present enough with yourself that you can recognize what is coming and you can catch yourself before falling into those feelings. Remind yourself why you’re putting yourself through all of this; keep that end goal in your mind always and don’t lose sight of it. Connect in and visualize the excitement and the feeling you’re going to have when you do achieve that goal. Visualize that win, the goal, that greatness. You need to be very mindful here and consciously remind yourself, day after day, of what the end goal is and why it’s so important to you. Nothing is built overnight. Everytime you push through an obstacle and commit to yourself and your goals, you’re reminding yourself how badly you want it. The more you do that, the stronger you become. You never know which moment will be the one where all of a sudden, everything just connects. Trust in this process. Don’t allow your ego to take over, who wants to quit when things get hard. As Brendon Burchard says, you need to honor the struggle…because it’s not supposed to be easy. Reaching your goals isn’t easy; if it was, every one of us would accomplishing every single thing we ever wanted to in life. It just doesn’t work like that. You are going to hit obstacles along the way, but when you honor the struggle, you view each of those obstacles as a blessing, a learning and something to be grateful for. Because every mistake, every obstacle, every mis-step along the way gives us more information and clarity as to what we want, what we don’t want, what’s working and what isn’t, who we are and how strong we really are. Part of going through this process is discovering that yes, it is hard and there are no short-cuts, but you can find the good behind each of those struggles. There is no quick fix (at least not if you want something that will last long-term). But when you embrace the struggle and you trust in the process, you’ll know that you’re going to feel so good at the end of it, regardless the outcome. Have the mental strength to tell yourself that wherever this leads you, whether it’s right to your goal or not, it’s where you are meant to be in your life. Sometimes, we don’t even know where life is going to lead us and that’s so exciting. Embrace that change and that uncertainty in this process. When you resist that, everything becomes hard. When you embrace the fact that regardless the outcome, the process will be worth it, you’re going to have more fun with it. You’ll have more joy and more excitement and less dread. That’s how you push past the discouragement; instead of viewing it as an obstacle in your path, view it as the universe giving you an alternate path that you hadn’t thought of before. Look at things differently; that is the power of shifting your mindset. On a weekly basis, reflect and debrief what worked and didn’t work. Then make some strategic shifts for the following week so that you don’t keep doing the same things over and over again. It’s easy to stay discouraged when you keep spinning those same wheels and making no progress; at least if you’re making shifts and changes and trying new strategies, you’re learning so much in the process. These are all things that we go through in HIgh Performance coaching and what I am bringing my group coaching members through. If you’re lacking in these areas, it’s so important that you get the tools you need so that you can succeed. I so often see people struggling and they don’t have the right tools or the right support around them; they get discouraged because they aren’t making progress (because they just don’t know HOW to anymore) and they give up on their dreams. It doesn’t have to be that way for you. Please reach out to me or to someone who you feel like would be the right fit for you. Take that step; your goals aren’t going to magically fall into your lap. You have to start taking those steps to get there. If you want information on Group Coaching, send me an email at [email protected] . And please reach out to me on Instagram (@charlotte_ferreux) and share your struggles, your successes and what you’re working on! I’d love to hear from you!